If you know someone that loves leather, they will love easy DIY Christmas gift…a leather keychain! These DIY leather keychains only take a few minutes to throw together and the result is so cute! 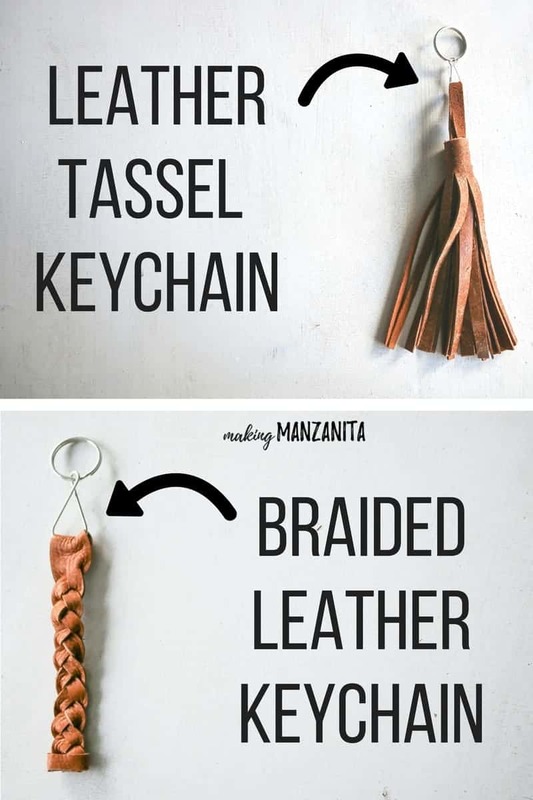 There’s a tutorial for two different kinds: a leather tassel keychain and a braided leather keychain. Take your pick or make them both! Hello and hello! 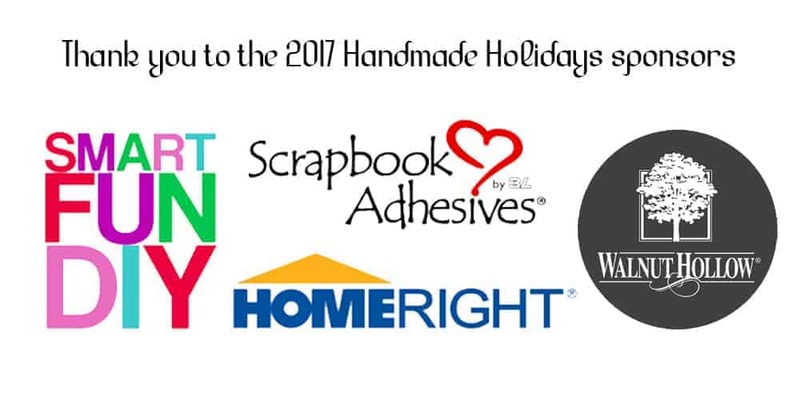 Welcome if you are joining from the 7th Annual Handmade Holidays Blog Hop 2017. Today it is all about handmade gifts, which are probably one of my favorite things in the world (for real!). I absolutely LOVE making, giving and receiving handmade gifts. There’s something so special about watching someone unwrap a gift that you handmade with love for them! 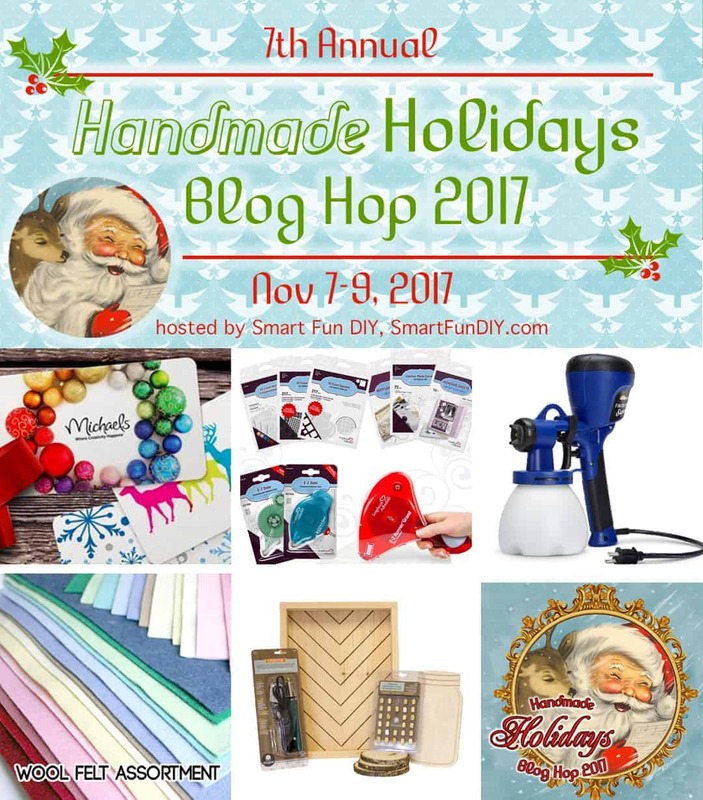 Don’t forget to hope around to the rest of the blogs at the bottom of the post so you don’t miss out on an awesome Christmas decor project! For today’s DIY Christmas gift idea, I’m sticking with leather. 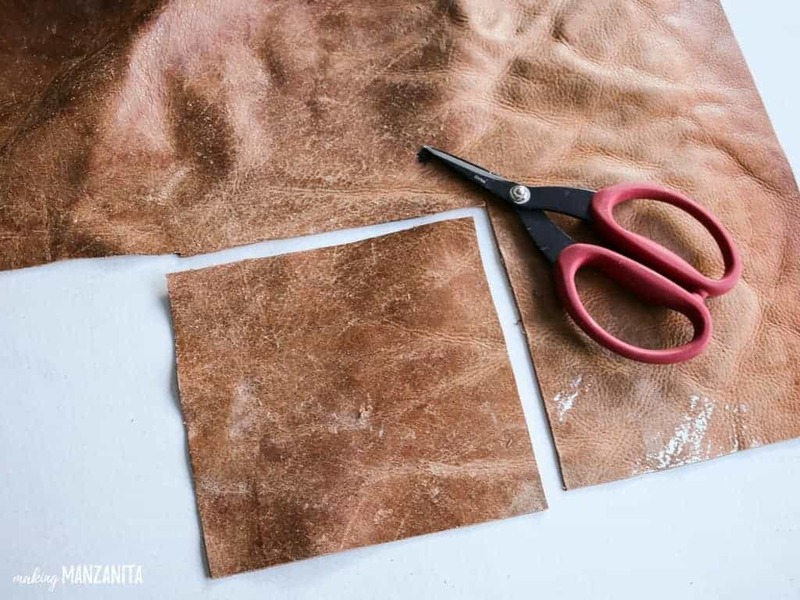 If you’re a regular Making Manzanita reader, you know that earlier this year I found a way to get FREE leather for my crafts….are you curious?? 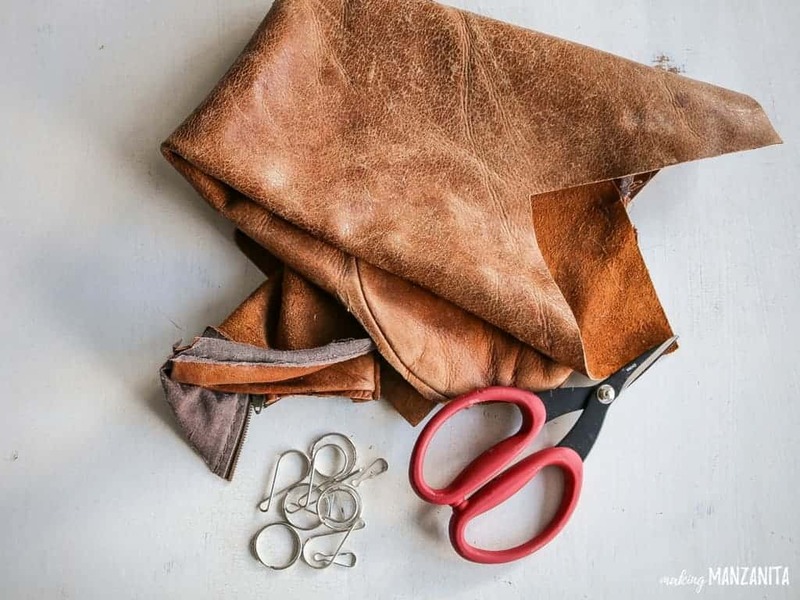 Hop on over to this post to see how I get free leather for crafting! The moral of the story is that I’ve got oodles of leather sitting in my garage, so I wanted to come up with some fun ways to make DIY Christmas gifts using my leather stash… and the leather keychain was born. I also made some leather bookmarks! 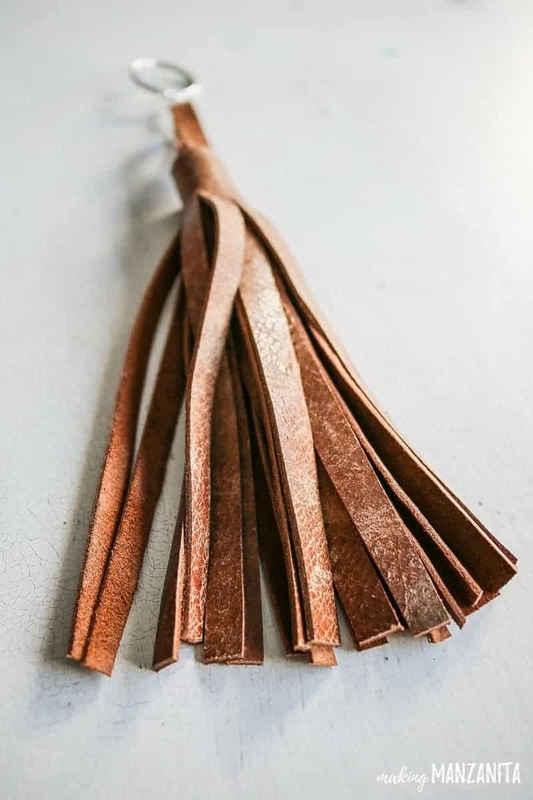 There are a few people on my holiday shopping list that I think would love these leather keychains and then, of course, I’ll be keeping some for myself too….That is the best part about making DIY Christmas gifts right?! Treating yourself to some extras!! UPDATE: Video tutorial can be found at the bottom of this post !! 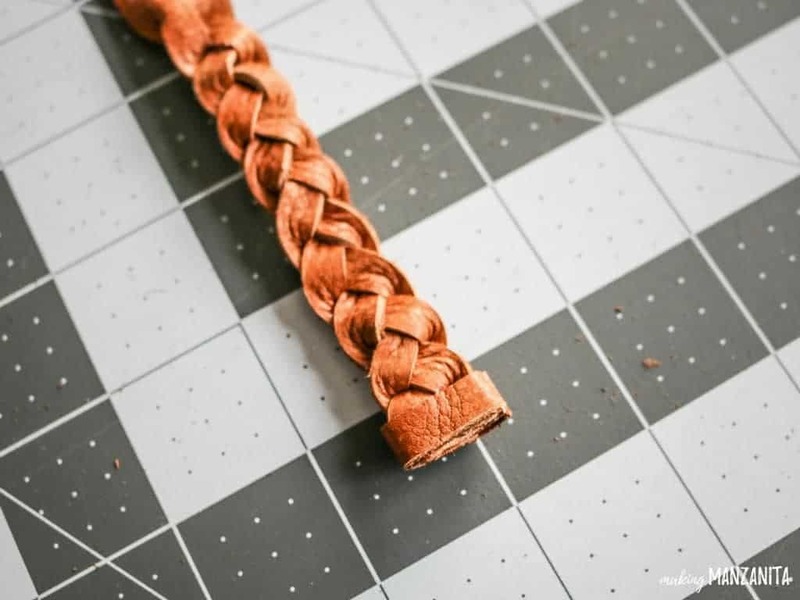 Let’s jump right into these DIY leather keychain tutorials! Step 1. Cut square of leather. Using these awesome crafting scissors, cut a square piece of leather about 8 in x 8 in. You could go smaller if you wanted as well! Step 2. Mark line about 1 inch down from the top. On the back side of the leather, use a pen to mark a line about 1 inch down from the top of the square. This will be your guide line where your tassel pieces end. Step 3. Cut 1/4” slits up the leather. I used a rotary tool and clear acrylic ruler to cut 1/4 inch slits up the leather all the way to the guide line that we drew. Continue all the way across the square of leather. Using a small strip of leather about 1/4” x 3”, glue on the hanger onto the back side of the leather. Step 5. 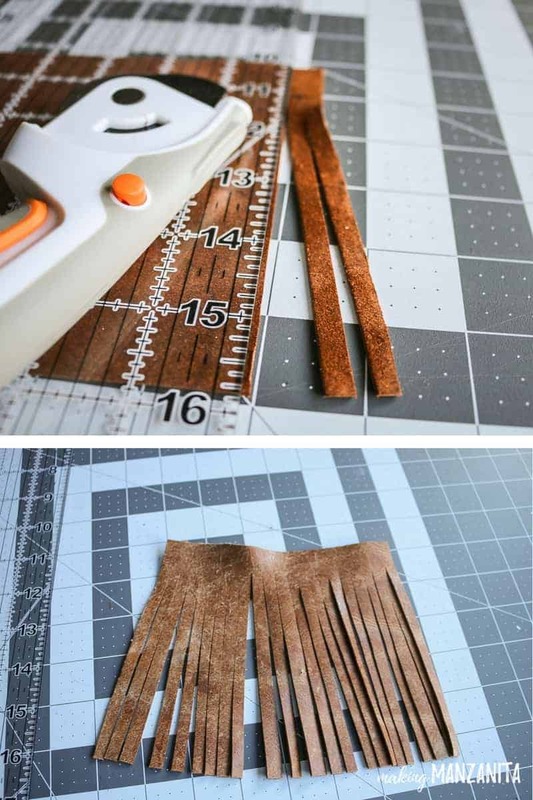 Glue and roll up leather tassel. Add glue all along the top portion of the leather on the backside and start rolling. You’ll really start to see the tassel come together when you start rolling. Step 6. Attach tassel leather keychain to hoop. Loop the hanger of the tassel onto a lanyard hook and attach to a split ring. Both the lanyard hook and split ring can be purchased in this little set of keychain accessories. Isn’t this leather tassel keychain adorable?! I love how it turned out! 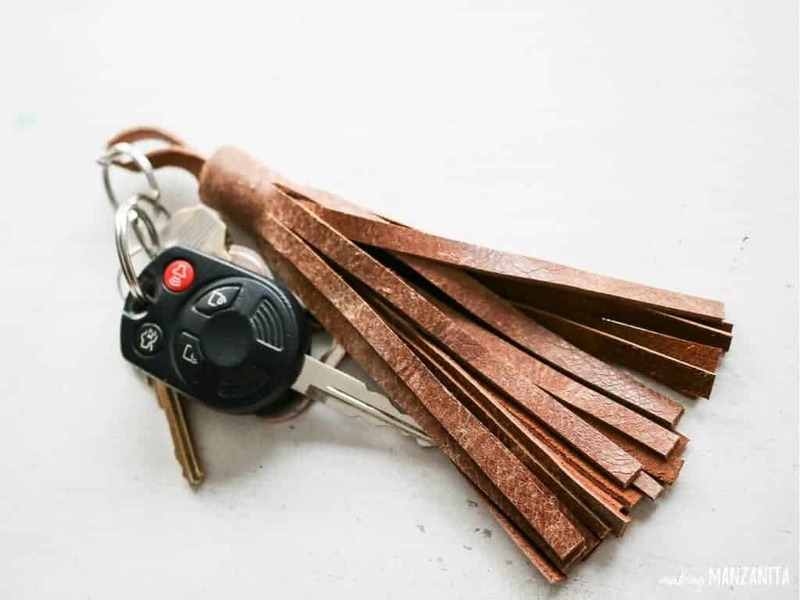 Tassels are pretty trendy right now and so is leather, so this DIY leather keychain is a great idea for a lot of different people on your holiday list this year. Are you ready to see leather keychain #2?? Step 1. 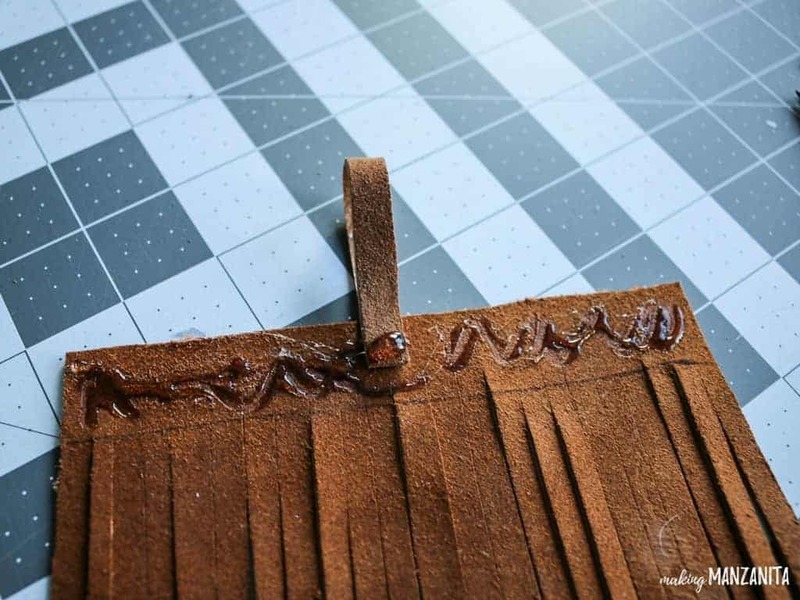 Cut strip of leather. 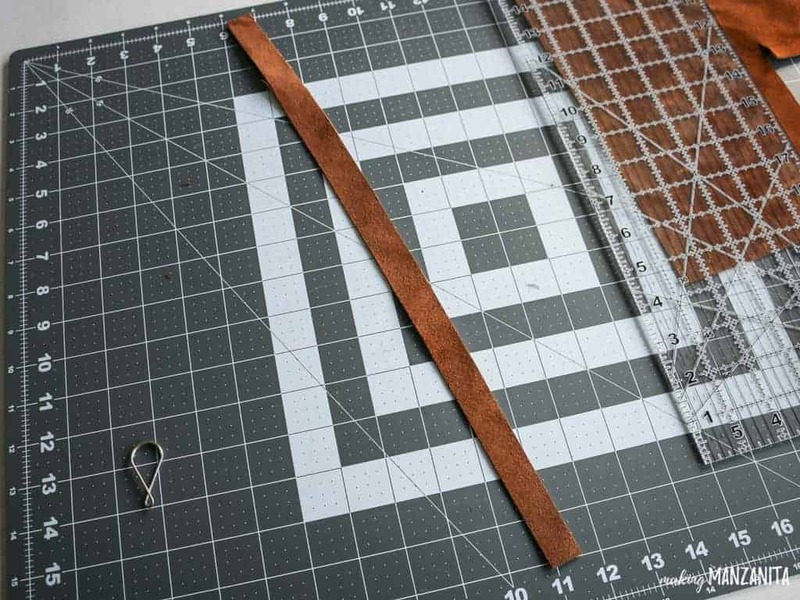 I really had no idea how long the leather strip needed to be, so I cut it extra long…probably about 2 feet, you probably could get away with a strip only 1 foot long. I ended up cutting off a lot of excess at the end. The width of the strip was 3/4”. Step 2. Cut slits 1/4 wide. Leaving about 1 inch at the top (similar to the way we made the leather tassel keychain), cut 3 slits in the leather 1/4” wide. Next, simply braid the leather down until you get a length you’re happy with. I did about 5-6 inches or so. Step 4. Secure end of braid. 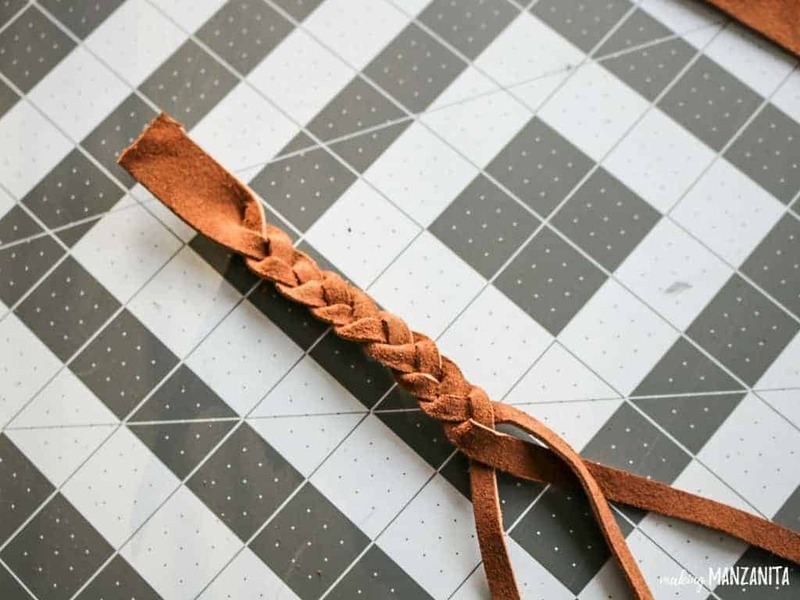 To secure the end of the leather braid, add a drop of glue on each strand of the braid on hold tight. After the braid was secured, I cut off the extra leather. Step 5. Wrap end of braid. 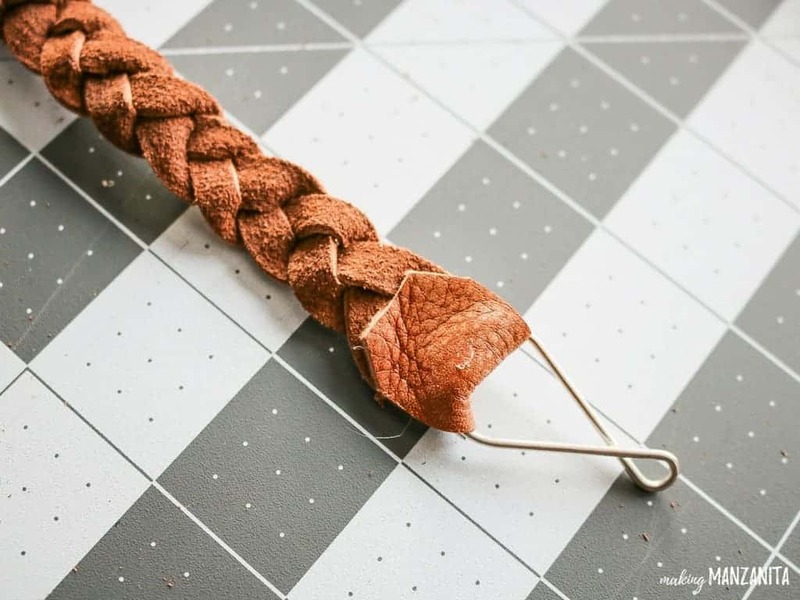 To cover up the glue spots at the end of the braid. I glued another piece of leather around the end. This finished off the braided leather keychain nicely. Step 6. Secure to keychain. 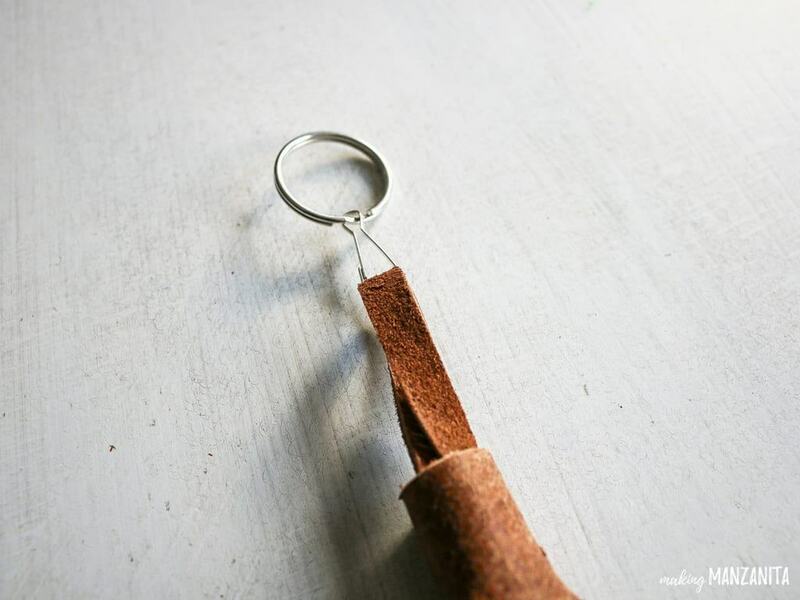 Using the larger loop part of the 8 shaped key ring, feed the top of the leather keychain through the hoop and glue to secure. Lastly, I added the 8 shaped key ring to the split ring. Both the 8 shaped key ring and the split ring can be found in this little set of keychain accessories. 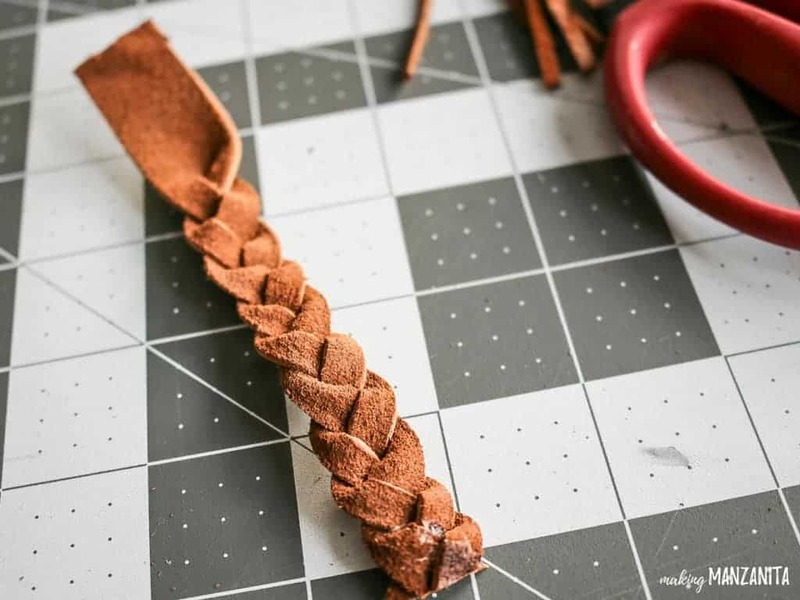 This braided leather keychain can probably be whipped up in 5 minutes or so! Seriously, can you think of an easier DIY Christmas gift idea that will ACTUALLY get used. 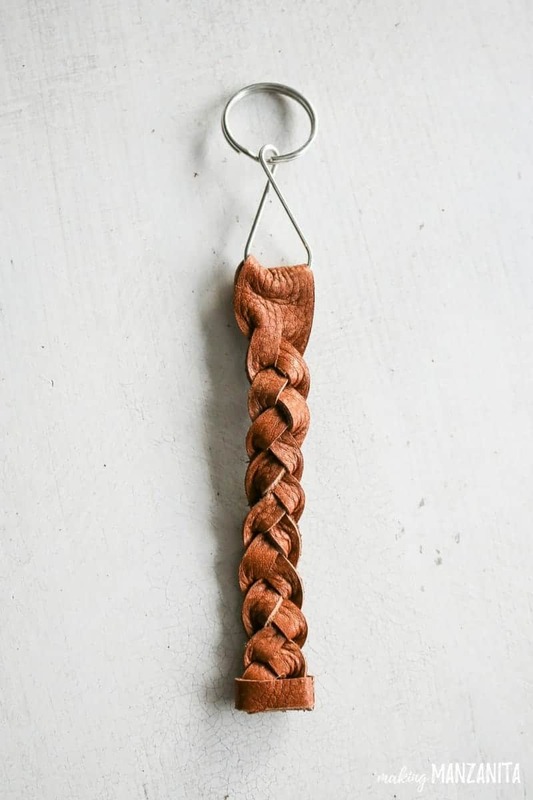 I love how this braided leather keychain turned out too! I don’t really know which one I like more! 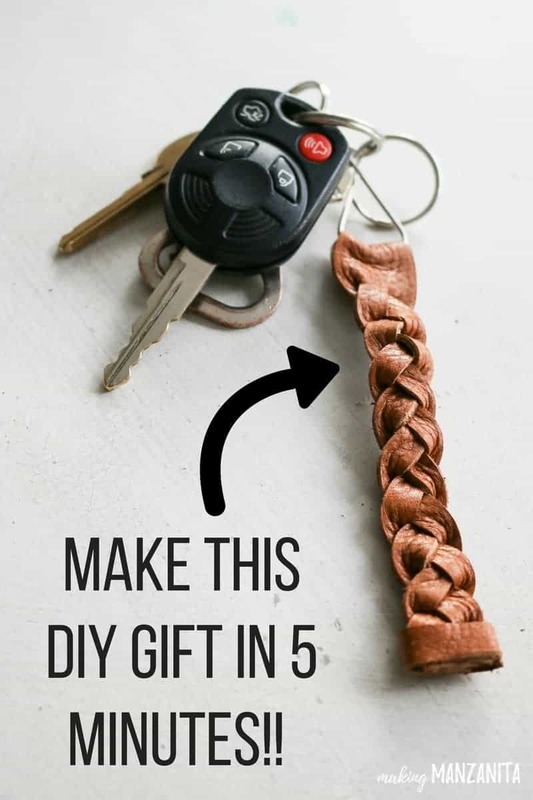 If you’re looking for a simple DIY Christmas gift that you can make in minutes, give these leather keychain tutorials a try. You’ll have time to make yourself a couple. Which leather keychain is your favorite??? Here’s a replay for my live video tutorial. If you love videos, be sure to check out my video page for more. 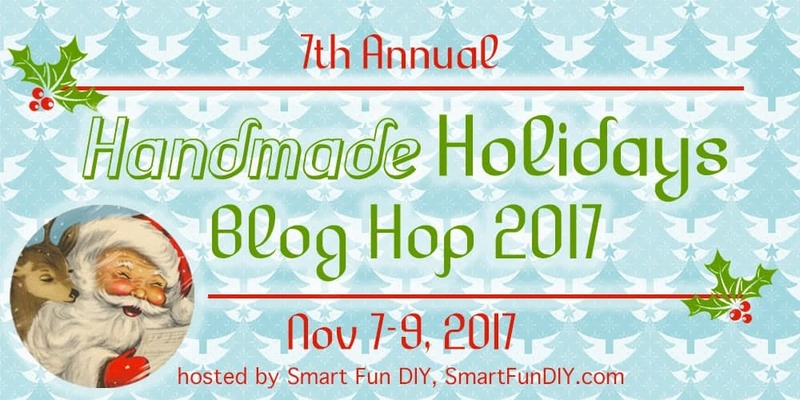 Don’t forget to hop around to the other bloggers of the 7th Annual Handmade Holidays Blog Hop 2017! I don’t know which keychain I like more, the tassel or the braid. Both are fabulous! Thanks for the tutorial! Of course Dana! Thanks for your comment! I love these! They’re very stylish but also a totally useful gift at the same time. Thanks for sharing! Of course, thanks for your comment Cat! I’m sitting here kicking myself for giving away the old leather coat that was way out of style. These are so simple to make yet brilliant and beautiful. I need to head to the thrift store and buy supplies (aka old out of style leather jacket) to make a few for my family/friends. Bummer!!! Yes, I’m sure you could find some other leather jacket at the thrift store. I got my free leather by skinning a couch of Craigslist that someone was giving away! I have just started crafting with leather. thanks for these ideas. 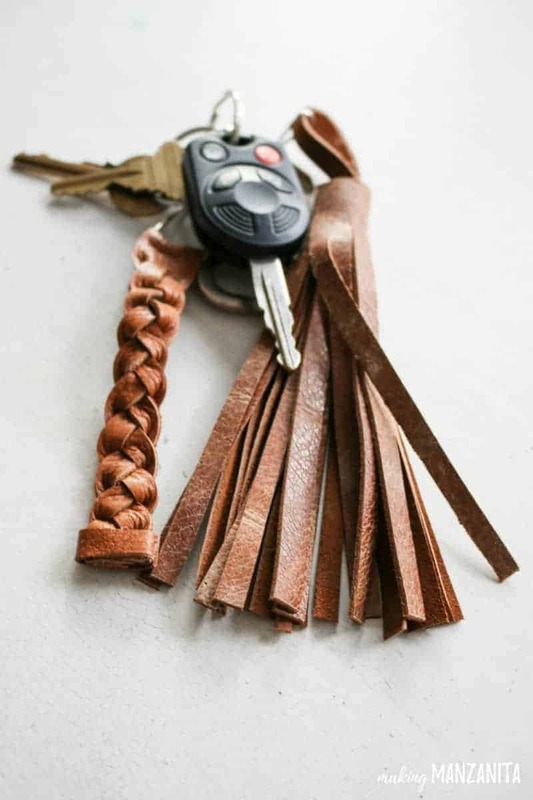 This leather key chain idea is fabulous! I’m a big fan of natural elements and I think I have more than a few friends who would love a gift like this. Perfect! They are so easy to make 🙂 Thanks for your comment Patti! These are great! I’m planning a leather project for next week. We’ll see how it goes! Leather projects are so much fun! Good luck with yours. Love the leather tassel especially!! The tassel keychain is so much fun! Me too 🙂 Thanks Angela! Cute idea! I’ve had grand crafty plans to make a tassel for a bag zipper pull that broke. It’s yet to happen, lol! This is giving me inspiration, esp. the 5 minute part. 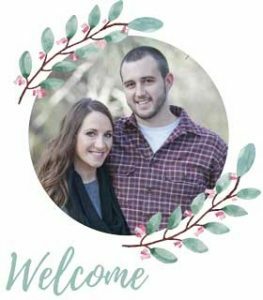 Visiting from Handmade Holidays. I love this! Especially the tassel one! I am always fumbling for my keys in my purse – this would be perfect. Simple and so pretty! Oh, I love these leather keychains. So cool made out of leather. Thanks for the inspiration! I love the smell of leather. I think both are great designs. 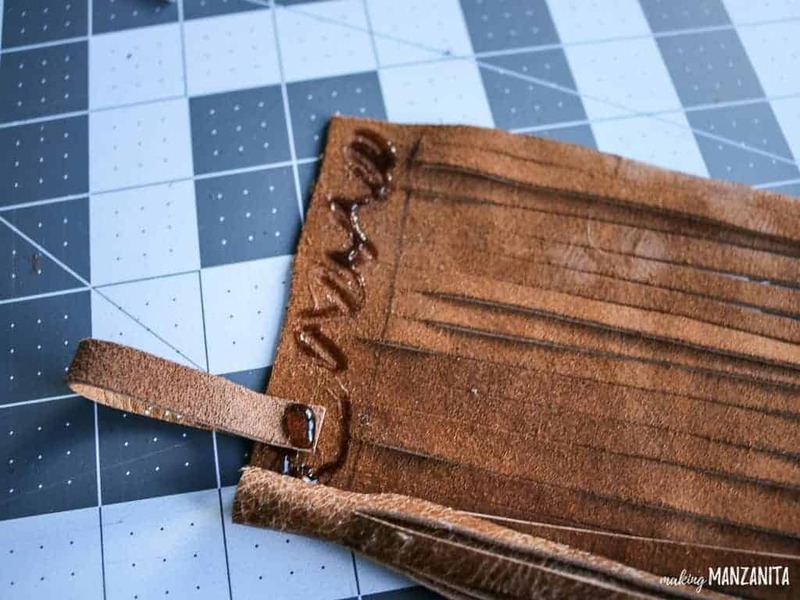 You know, I’ve never actually crafted with leather before…I guess because I’m kind of intimidated by it…but this looks pretty easy! And my sister would love that tassel keychain. Maybe I’ll give it a try! Thanks for the inspiration! This looks soo pretty, I love the idea! And adding some charms or textile will make the perfect gift for a boho chic girl.